On Sunday, March 19, 2017, CBS 60 Minutes featured a powerful segment on how the world is responding to the ongoing humanitarian crisis in South Sudan. 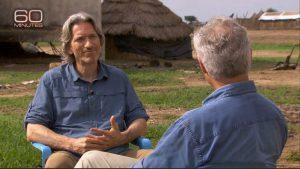 Enough Project Founding Director John Prendergast was in South Sudan when 60 Minutes correspondent and CBS Evening News anchor Scott Pelley was doing the story, and Pelley interviewed Prendergast there on the root causes of the crisis. Read this Washington Post op-ed “South Sudan’s Government-made Famine” by The Sentry co-founders George Clooney and John Prendergast. As the people of South Sudan suffer, there has still been no accountability for the atrocities and looting of state resources, or for the famine that results from these actions. Join us and tell President Trump that war crimes shouldn’t pay. Sign up for Enough Project’s newsletter below.